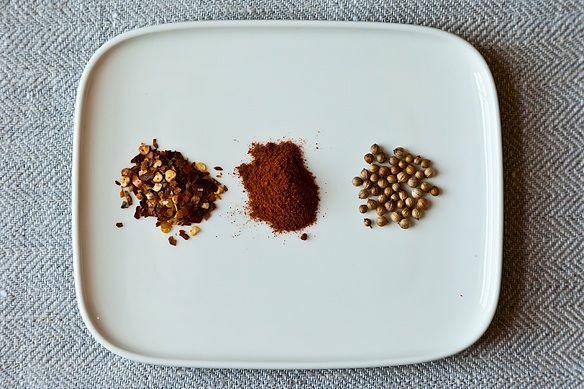 There’s a reason spices have been prized since ancient times: they’re magical. A sprinkle, a pinch, a dab, a dash: a tiny bit can whisk a plate of food from one country to another, one cuisine to the next. And luckily, spices from all over the world are accessible to home cooks willing to venture to the grocery store, or to one of many great spice purveyors online. Every good cook, though, requires restraint. And believe us, it took a lot of restraint to whittle our list of favorite spices down to ten. (We even asked you for help.) Here are our 10 Essential Spices, plus some of our favorite ways to use them. Cumin: Cumin, which can be used ground or as whole seeds, adds a warm, earthy quality. It's popular in Indian, Pakistani, Middle Eastern, Cuban, Brazilian, and Northern African cooking, as well as the Chinese cuisines of Sichaun and Xinjiang. If using the seeds, which last longer and have a stronger aroma than ground cumin, toast them gently in a dry pan or in the oven to enhance their flavor. Toast the seeds and add them to curries, chilis, stews, and soups; rub onto root vegetables and/or cauliflower with olive oil, salt and pepper, and roast; use in a spice rub with salt and pepper for roasted chicken; add to guacamole, hummus, or another creamy dip; use in a Moorish paella; toss into a stir fry with ground meat and vegetables; season soft-scrambled eggs. Cayenne Pepper: Cayenne peppers are generally dried, ground, and sifted to make the spice known by the same name. The hotness produced by cayenne pepper is caused by its high concentration of capsaicin, which is believed to have many health benefits (detoxing being one of them). It adds a smooth, pervasive heat to any dish, and it is typically the key ingredient in many hot sauces. Rumor has it that Christopher Columbus encountered cayenne peppers on his explorations in the Caribbean Islands and brought them back to Europe, where they were used as a substitute for then-expensive black pepper. Use a pinch in hummus and guacamole to add a spark of heat; work into Shrimp Gumbo; toss with roasted vegetables, olive oil, salt, and pepper; sprinkle into salads and salad dressings; carefully work into sauces, soups, chilis, and stews. Red Pepper Flakes: Crushed red pepper flakes are made from various combinations of dried hot chilis, such as ancho, bell, and cayenne. They add a bass level of textured heat to any dish. 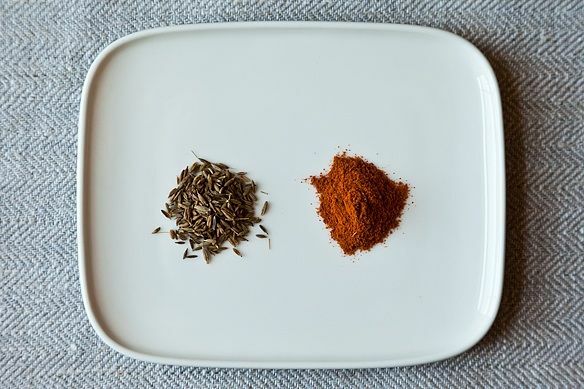 While many associate crushed red pepper flakes with Italian food, they are also used in Chinese, Cajun, Carribbean, and most cuisines in Latin and South America. Since different blends vary on their level of intensity, make sure to pay attention to the amount you add to a dish. Sprinkle the flakes onto pizza (like this Broccoli Rabe, Potato and Rosemary Pizza) and pasta dishes; toss with roasted vegetables; add to a tomato-based sauce; brighten up a piece of fish or a plate of shrimp; sprinkle onto toast with avocado, salt, pepper, and lemon juice; add to sautéed greens. Smoked Paprika: Smoked paprika, also known as pimenton, is made in Spain from smoked, ground pimiento peppers. It comes in a variety of intensities and flavors: dulce (sweet and mild), agridulce (bittersweet and medium-hot), and picante (hot). Pimenton is a building block of Spanish cuisine, and lends a smoky, earthy quality to meats, fish, and vegetables. Rub onto roasted potatoes and other roasted vegetables with salt, pepper, and olive oil; sprinkle onto fried potatoes; add to condiments like salsa, aioli, vinaigrettes, and romesco sauce; mix with olive oil and marinate feta cheese; combine with salt and pepper to season meats and fish before roasting or grilling; sprinkle onto poached, fried, or deviled eggs. Try our Moroccan Merguez Ragout with Poached Eggs; rub onto grilled corn. Coriander: Coriander seeds are the seeds of what US English-speakers refer to as cilantro. When crushed, they have the similar citrusy, slightly-spicy flavor of their leafy counterparts. Like cumin, you can find coriander in both seed form and ground form; however, since ground coriander loses its flavor quickly, it is best to buy whole seeds and grind them fresh. To enhance their flavor and aroma, you can toast the seeds in a dry pan or oven before use. Work coriander seeds into curries, stews, and soups; toss with roasted vegetables, salt, pepper, and olive oil; use in rice dishes, like Mujaddara; add to pickling brine; use as an alternative to caraway in rye bread; make sausages with it, as they do in Germany and South Africa; brew into Belgian-style wheat beers; crack with black pepper and use to coat chicken breasts. Cloves: Cloves are the aromatic dried flower buds of a type of evergreen tree and resemble tiny, 1/4-1/2 inch long nails. Known for their warm, sweet, aromatic taste, they can be used both whole and ground (whole cloves are often studded into meats and vegetables for cooking). 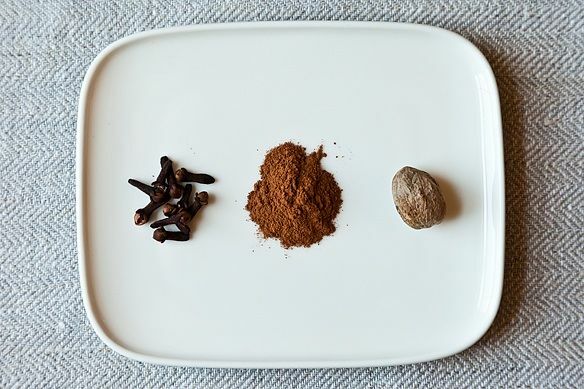 Indian, Mexican, and Vietnamese cuisine all use cloves in savory foods, while many American recipes call for cloves in desserts. Add to fragrant broths, such as pho; mix into drinks, like apple cider; simmer them whole in this Shrimp Biryani; grind and use in gingerbread, shortbread, spice cake, and autumn -- and winter -- spiced desserts. Cinnamon: Cinnamon is obtained from the bark of several trees from the genus Cinnamomun; there are over 100 different varieties of the spice. It is used in both savory cooking and sweet; the Middle East, for instance, features cinnamon as a spice in many chicken and lamb dishes. Smelling cinnamon is also supposed to increase brain activity -- a theory we can get behind. Use it to flavor bastilla, tagines, and hearty stews; sprinkle onto toast with sugar and butter; add to a cookie recipe; sprinkle onto breakfast puffs; stir into oatmeal; sprinkle into mediocre coffee (or good-quality, for that matter); work into an ice cream base (because, as Kristen Miglore says, everyone knows cinnamon ice cream is the best kind of ice cream). Nutmeg: Nutmeg is the seed of the nutmeg tree, a tree that produces two spices: nutmeg and mace (mace is the dried, lacy covering of the nutmeg seed!). It is used to spice savory dishes – like in Indian or Middle Eastern cuisine – or in dessert recipes. Known for it’s slightly-sweet, woody taste, it can be bought whole or ground; but, like other spices, it is most flavorful when ground fresh. Work it into a gooey, cheese-y dish like fondue or quiche; use in a béchamel sauce; bake into autumn- and winter-spiced cakes, cookies, and pies; use in David Eyre's Pancake; garnish a mug of eggnog. Ginger: Ground ginger, the ground, dried root of the ginger bulb, adds a citrusy, floral, earthy zing to dishes. It is used most often in baked goods, along with other earthy, aromatic spices like cinnamon and cloves. Fresh ginger, which is sharper than ground ginger and used more often in savory dishes, can be substituted for ground ginger at a ratio of 6:1. Use ground ginger in ginger cookies; add to pies, cakes, and tarts; make Monkey (Ginger)Bread; or use in a savory spice blend for curries, chilis, and soups. 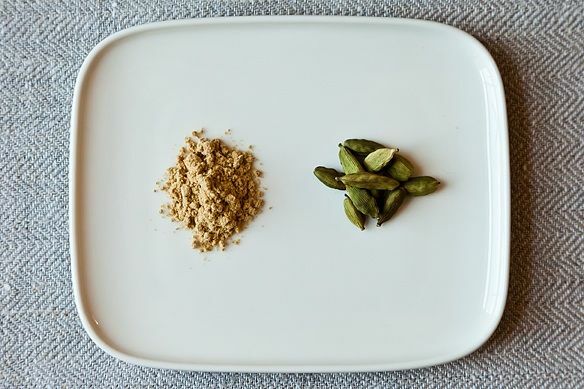 Cardamom: Cardamom, a pod-shaped spice, comes in black and green varieties. While both have a floral, resinous smell and taste, black cardamom is smokier and has a coolness similar to mint. Both types of cardamom are used in sweet and savory cooking, especially in the Middle East and Southeast Asia. Use it to perfume drinks such as Chai and hot chocolate; toss whole pods into rice as it cooks; grind and use in baked goods, such as cakes, coffee cakes, muffins, and shortbread; make Cardamom Doughnuts; use in a syrup to poach fruit; add to a brine for preserving lemons. What are your favorite ways to use these spices? Let us know in the comments! Bellissimo! I had a very difficult time with all theses spices last time I crossed the Atlantic! I find coriander frustratingly hard to grind. Any hints? I'm attending culinary school and we just finished our spices chapter! The pictures are gorgeous. Thank you! Praise the Lord! I have a new bible. Nice list; certainly rings true in our kitchen. One way we use several of the 10 (cumin, cayenne, pimenton) is to make simple savory and not-too-rich dipping sauces for steamed artichokes. Thin some low-fat (not non-fat!) mayonnaise with a bit of water to desired consistency; stir in an amount of one of the ground spices to whatever intensity tastes good to you; and dip and scrape away! p.s. Any reason articles like this can't be saved to our personal recipe collections? Great list - thank you! Tip: hang out in the "C" section of the spice aisle. Note how 7 out of 10 handy spices begin with the letter C? (I confess I'm counting "chile" for red pepper flakes.) Sorry... I'm a list geek who thinks cleaning closets is fun. Anyway, this is very useful for some new cooks I know... thanks! A very nice list! I love tossing cumin seeds with roasted cauliflower/broccoli (genius idea from melissa clark!) or any spiced dish really, and cardamom in baked goods, tea, and coffee. I love, love, love a pinch of cardamom in spiced mustard greens or collards too. 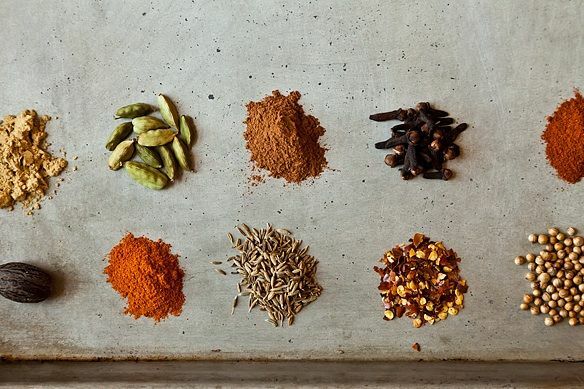 Ayurveda (traditional indian medicine) says that spices are medicine, and I believe it! I would definitely agree with your list of 10 essential spices; those are the 10 I use and love most. I love to use coriander in my homemade green chile sauce but had no idea that it was the seed of the cilantro plant. That's amazing! Now I can finally trace the faint hint of cilantro in my enchiladas! Thank you! I often add whole cardamom to the water when boiling chicken (I also add cinnamon sticks, bay leaves and cloves). It makes for a wonderfully fragrant and tasty stock that I use instead of plain water when making rice. I love to drink Turkish coffee and I often add ground cardamom before preparing it. Cumin is often used in middle eastern dishes that include chick peas, fava beans, lentils, etc because it is supposed to aid in digestion. My favorite cardamom recipe is potatoes mashed with butter, cream cheese and cardamom. My kids request it for every holiday dinner. Good list. i have them all and probably 60 more. 1) Buy whole if that makes sense. 2) Avoid grocery store spices - way over priced. You can often get much better prices in local ethic stores if you are lucky - or on-line in bulk. Fennel seeds are essential to my cooking - from a hint of Italian sausage in a tomato sauce to layer flavors when cooking fresh fennel. And I prefer mace to nutmeg in everything except eggnog! my fave spice is garlic powder-no fussing with fresh garlic but plenty of great flavor! My "new" favorite spice is star anise. Sometimes I just open the jar on the counter and smell it. It is so beautiful and aromatic! Also love ginger and green cardamom -- have been making a lot of Chai lately. Thanks for this lovely list. We love fresh cilantro and "need" to experiment more with dried coriander. :D So many spices, such little time. Great list. I'll be sharing it on my FB fan page. I'd also have to throw turmeric into this spicy mix. It adds amazing color and love the earthy aroma. I'm a big fan of aleppo pepper-- I think it has more flavor and less heat than cayenne. I like using it with paprika too. Glad Cumin made your list, but how odd that you would not mention that it is used in Mexican cuisine, to which it is essential! At first I was also wondering where the herbs were until I saw the comment trails below. This is an interesting and certainly relevant list. Although I've never been a big fan of red pepper flakes (except for sprinkling on pizza), I can see why it's on the list and it is certainly in my cabinet. I also prefer fresh ginger over ground ginger for cooking savory items.